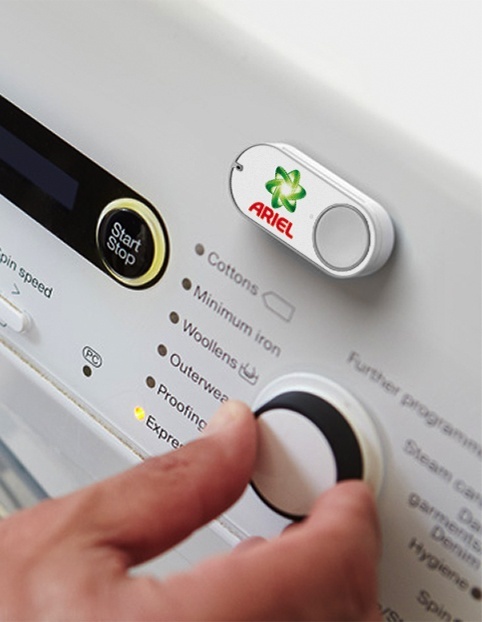 Amidst a sea of growing tech, the humble button makes waves as orders through Amazon's Dash Button rocket. You're in the bathroom, you pump the handsoap and see that it is running low. You make a mental note to buy some more next time you're in the store. A few days later, you go to wash your hands, and the pump coughs up nothing but air. We've all had similar experiences with replenishable goods, be it toothpaste, soft drinks, dishwasher tablets, nappies, pet food, cosmetics... the list goes on, and quite often, those mental notes to buy more often fail us. Amazon have taken a huge step toward tackling this problem with its Dash Button, a small device that lets you re-order your replenishables with a single button press. The next part of the process for the user is the goods arriving at their door. Over the past year, order volumes made with the dash button have increased fivefold. The evident success of the little device has caught a lot of attention, with 60 new brands signing up for their own Dash Button this month, bringing the total of available Dash Buttons to over 200. Amazon aren't the only ones who have realized the potential of simplicity. 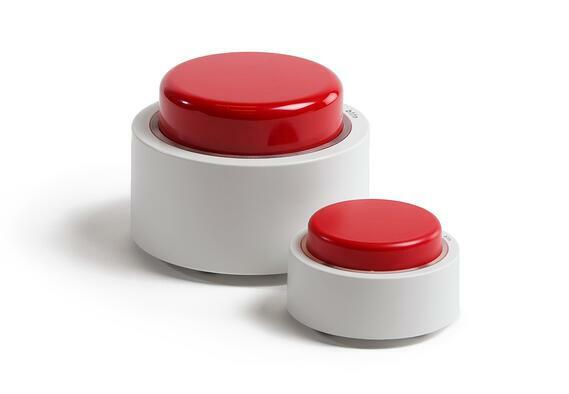 Before the Dash Button was launched last year, Finnish company Bttn were selling their own web-enabled button devices, but with a lot more room for customization. Bttns can be configured not only for one-click orders, but for almost anything that is required. Bttns are capable of connecting to the internet via WiFi or Mobile data, and can be configured to work with an existing infrastructure. One model even has lights around the button which can be set up to show different colors depending on the result of the button press. Because the function of Bttns are highly customizable, they offer more than just an opportunity for restocking - they offer the chance for spontaneity. It reduces the decision chain to a minimal, so the possibilities here for ordering services, food and drink in restaurants, hotels and bars are really quite exciting. They are even customizable in appearance, they can be made to suit any mood, setting, or brand. Here at Luxus, we've given custom-branded Bttns to a number of our clients, enabling them to request support from us at the press of a button. We're even running a trial for a leading UK department store, where customers can use a Bttn to request service at counters that are not manned at all times. Plus, we've set a few up for ourselves: one makes an order for our favorite pizzas (which keeps our late-working #LuxusHeroes happy) and another sends a message to everyone on our internal chat app to let us know when there is beer in the fridge. How could your clients benefit from a button? Since the bigger, well-established brands of consumer-packaged goods are going to be the priority for Amazon and new team-ups for their Dash Buttons, it's the highly customizable Bttn that stands to cater for the needs of many smaller companies and their clients. We're big fans of these things, so get in touch if you're looking for an innovative way to boost sales, ease of communication and customer satisfaction. Want a button for your business?